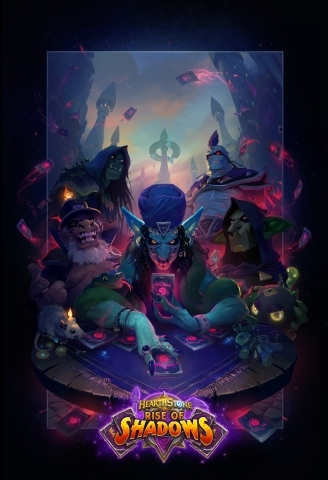 IRVINE, Calif.--(BUSINESS WIRE)-- A new coalition of villains has risen to power, and Hearthstone® players around the world get to be the bad guys in Rise of Shadows™, the next expansion for Blizzard Entertainment’s smash-hit digital card game. Starting April 9, players will be able to join a league of miscreants as they embark on Hearthstone’s first-ever yearlong story line, with 135 dastardly new cards and some wickedly devious new mechanics. Join the ranks of the League of E.V.I.L. and learn more at RiseOfShadows.com. Best known for blockbuster hits including World of Warcraft®, Hearthstone, Overwatch®, the Warcraft, StarCraft®, and Diablo® franchises, and the multi-franchise Heroes of the Storm®, Blizzard Entertainment, Inc. (www.blizzard.com), a division of Activision Blizzard (NASDAQ: ATVI), is a premier developer and publisher of entertainment software renowned for creating some of the industry’s most critically acclaimed games. Blizzard Entertainment’s track record includes twenty-two #1 games* and multiple Game of the Year awards. The company's online gaming service, Blizzard Battle.net®, is one of the largest online-gaming services in the world, with millions of active players. Information in this press release that involves Blizzard Entertainment's expectations, plans, intentions or strategies regarding the future, including statements about the pricing, pre-purchase, release dates, features, and functionality of Rise of Shadows are forward-looking statements that are not facts and involve a number of risks and uncertainties. Factors that could cause Blizzard Entertainment's actual future results to differ materially from those expressed in the forward-looking statements set forth in this release include unanticipated product delays and other factors identified in the risk factors sections of Activision Blizzard’s most recent annual report on Form 10-K and any subsequent quarterly reports on Form 10-Q. The forward-looking statements in this release are based upon information available to Blizzard Entertainment and Activision Blizzard as of the date of this release, and neither Blizzard Entertainment nor Activision Blizzard assumes any obligation to update any such forward-looking statements. Forward-looking statements believed to be true when made may ultimately prove to be incorrect. These statements are not guarantees of the future performance of Blizzard Entertainment or Activision Blizzard and are subject to risks, uncertainties and other factors, some of which are beyond its control and may cause actual results to differ materially from current expectations.